Phineas and Ferb (television) Animated series on Disney Channel previewing on August 17, 2007, and then debuting February 1, 2008. Two step-brothers attempt to make every day of their summer vacation count by building innovative creations, including the world’s largest popsicle and a backyard roller coaster, much to the exasperation of their tween sister, Candace. 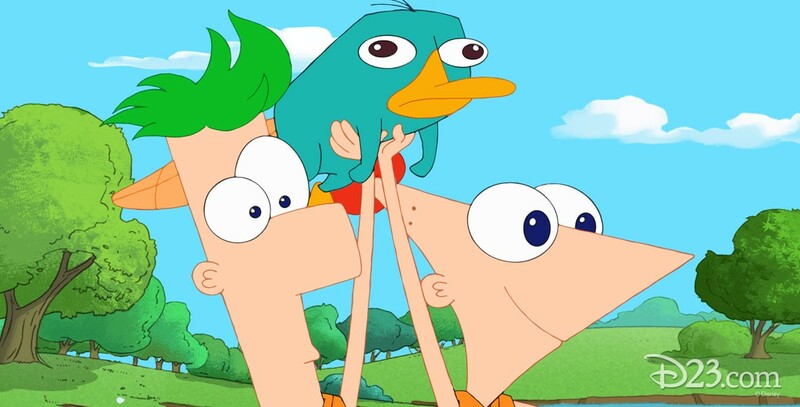 Meanwhile, the family’s simple minded pet platypus, Perry, leads a double life as a secret agent and faces off with the evil Dr. Doofenschmirtz in each episode. Voices include Vincent Martella (Phineas Flynn), Thomas Sangster (Ferb Fletcher), Dee Bradley Baker (Perry the Platypus), Mitchel Musso (Jeremy), Caroline Rhea (Mom), Richard O’Brian (Dad), Alyson Stoner (Isabella), Ashley Tisdale (Candace). From Walt Disney Television Animation; created by Dan Povenmire and Jeff “Swampy” Marsh.